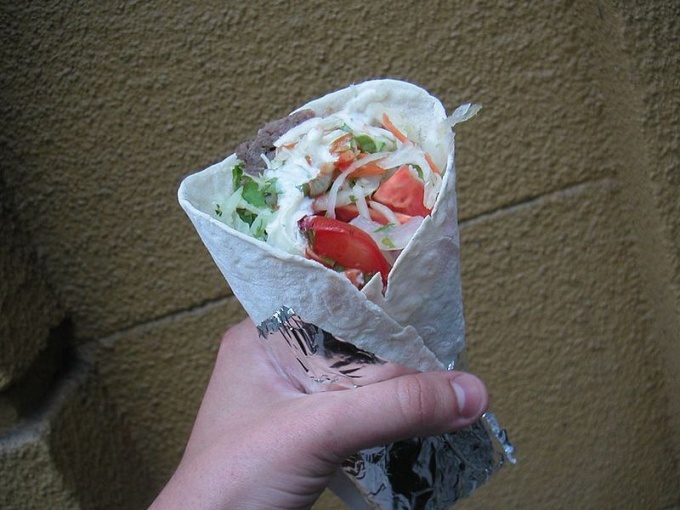 It is called "kebab", "Shawarma" and sometimes "shawarmas". It is wrapped in all kinds of cakes – from pit to thin Armenian lavash. It is sold at metro, railway stations and in quite a decent café. As if it is not treated a society, we must admit – it is really tasty! Chop onions and garlic, which are then put into the sauce. Mix sour cream and mayonnaise, taken in equal proportions. Very finely chop the parsley. Combine all ingredients and how to whisk with a whisk. If desired, the mixture can penetrate into the blender. For lovers of exotic flavours, the sauce is good to add a little curry powder or turmeric. But the traditional Shawarma does not provide for such supplements. Fry the meat. Better take veal, beef or lamb. Note: too young veal at his, undoubtedly, dietary properties, has a rather weak taste. And the lamb is the roast much longer, and besides, there is a risk to run into the meat of the female, which has a specific smell. So a good beef – brisket or sirloin, cut into small pieces of 10-15 grams, salted and peppered, are the perfect meat for Shawarma. Slice the vegetables. Fresh cucumbers and cabbage – thin strips, tomatoes – small cubes (the tomatoes it is advisable to remove the skin and seeds). Salt. The proportions of vegetables can be arbitrary, but most often 1 Pete is 30 g of roasted meat, 50 g of vegetable salad and 25 g of sauce. If desired, the ingredients tab, you can zoom and also change the vegetables, chosen at will or according to the season. Assemble the Shawarma. Cut the pita bread crosswise, put into it fried the meat, chopped cucumbers, tomatoes and cabbage, and sauce. If Taco using pita bread, wrap the filling like an envelope. Can also use corn tortillas, tortillas. Although it will be a little different dish, they're really good too. If desired, use instead of meat poultry, e.g., chicken. Take the meat from the thighs, without skin and cartilage. Chop it, sprinkle with lemon juice, season with salt and sprinkle with black pepper krupnorazmernymi. Fry in butter – it will be also very tasty. For vegetarians we can recommend the option of a gyro without meat. They can fry in vegetable oil pieces of tofu. When fry Taco meat – not Iriarte and does not desiccate it. If suddenly it happened – pour into the pan a little water or broth, cover and leave for 5 minutes Taco Meat will once again become juicy. To Shawarma turned out juicy – do not be stingy with the sauce. If desired, you can use either mayonnaise or sour cream, but delicious – a mixture, taken in equal proportions.